This adorable blanket is sure to get lots of hugs. A plush little elephant attached to the center of a small cuddly wave stitch blanket is such a beautiful toy and blankie and the perfect gift for your next baby shower! This Cutie Elephant Blankie by Michele Wilcox is a quick project that any soon to be mom is going to absolutely love it. You’ll be amazed how cute this is in any colorway! 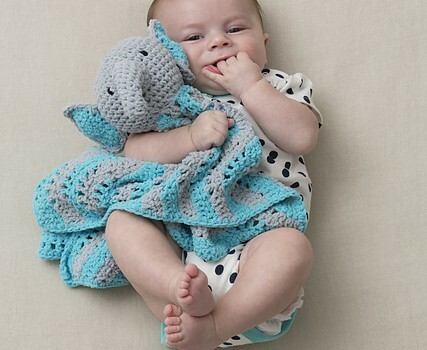 Pattern includes detailed instructions to help you make your little elephant blanket. Thanks to Michele for the article inspiration and featured image. Maybe in works for a someone new on her way. Made a couple of these and they are the cutest! I am working on this project but I do not understand the instructions for how to put the ear parts together. Could someone do this part while making a video of it and share so I can finish this super cute project? I’m making it as a gift and I’m bummed that I’m so close to finishing but I’m stuck on this part! Thanks! Katie Farris, don’t let Danielle see this or she will want one for Benji!